The maxillae (mac-SILL-ee) form the upper jaw and meet each other at a midsagittal suture (see figs. 8.3 and 8.4a). Small points of maxillary bone called alveolar processes grow into the spaces between the bases of the teeth. The root of each tooth is inserted into a deep socket, or alveolus. If a tooth is lost or extracted so that chewing no longer puts stress on the maxilla, the alveolar processes are resorbed and the alveolus fills in with new bone, leaving a smooth area on the maxilla. The teeth are discussed in detail in chapter 25. Suppose you were studying a skull with some teeth missing. How could you tell whether the teeth had been lost after the person's death or years before it? Figure 8.14 The Left Orbit, Anterior View. infraorbital foramen, which provides passage for a blood vessel to the face and a nerve that receives sensations from the nasal region and cheek. This nerve emerges through the foramen rotundum into the cranial cavity. The maxilla forms part of the floor of the orbit, where it exhibits a gash called the inferior orbital fissure that angles downward and medially (fig. 8.14). The inferior and superior orbital fissures form a sideways V whose apex lies near the optic foramen. The inferior orbital fissure is a passage for blood vessels and a nerve that supply more of the muscles that control eye movements. The palate forms the roof of the mouth and floor of the nasal cavity. It consists of a bony hard palate in front and a fleshy soft palate in the rear. Most of the hard palate is formed by horizontal extensions of the maxilla called palatine (PAL-uh-tine) processes (see fig. 8.5a). Near the anterior margin of each palatine process, just behind the incisors, is an incisive foramen. The palatine processes normally fuse at about 12 weeks of gestation. Failure to fuse results in a cleft palate, often accompanied by a cleft lip lateral to the midline. Cleft palate and lip can be surgically corrected with good cosmetic results, but a cleft palate makes it difficult for an infant to generate the suction needed for nursing. The palatine bones form the rest of the hard palate, part of the wall of the nasal cavity, and part of the floor of the orbit (see figs. 8.5a and 8.13). At the posterolateral corners of the hard palate are two large greater palatine foramina. In most vertebrates, the nasal passages open into the oral cavity. Mammals, by contrast, have a palate that separates the nasal cavity from the oral cavity. In order to maintain our high metabolic rate, we must digest our food rapidly; in order to do this, we chew it thoroughly to break it up into small, easily digested particles before swallowing it. The palate allows us to continue breathing during this prolonged chewing. The zygomatic27 bones form the angles of the cheeks at the inferolateral margins of the orbits and part of the lateral wall of each orbit; they extend about halfway to the ear (see figs. 8.4a and 8.5a). Each zygomatic bone has an inverted T shape and usually a small zygomaticofacial (ZY-go-MAT-ih-co-FAY-shul) foramen near the intersection of the stem and crossbar of the T. The prominent zygomatic arch that flares from each side of the skull is formed by the union of the zygomatic process of the temporal bone and the temporal process of the zygomatic bone (see fig. 8.4a). The lacrimal28 (LACK-rih-mul) bones form part of the medial wall of each orbit (fig. 8.14). A depression called the lacrimal fossa houses a membranous lacrimal sac in life. Tears from the eye collect in this sac and drain into the nasal cavity. Two small rectangular nasal bones form the bridge of the nose (see fig. 8.3) and support cartilages that give shape to the lower portion of the nose. If you palpate the bridge, you can easily feel where the nasal bones end and the cartilages begin. The nasal bones are often fractured by blows to the nose. There are three conchae in the nasal cavity. The superior and middle conchae, as discussed earlier, are parts of the ethmoid bone. The inferior nasal concha (inferior turbinate bone)—the largest of the three—is a separate bone (see fig. 8.13). The vomer forms the inferior half of the nasal septum (see figs. 8.3 and 8.4b). Its name literally means "plowshare," which refers to its resemblance to the blade of a plow. 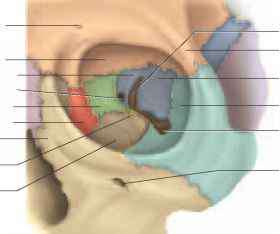 The superior half of the nasal septum is formed by the perpendicular plate of the ethmoid bone, as mentioned earlier. The vomer and perpendicular plate support a wall of sep-tal cartilage that forms most of the anterior part of the nasal septum. 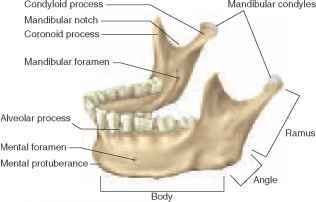 The mandible (fig. 8.15) is the strongest bone of the skull and the only one that can move. It supports the lower teeth and provides attachment for muscles of mastication and facial expression. 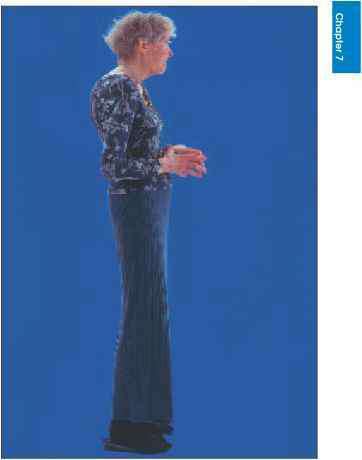 The horizontal portion is called the body; the vertical-to-oblique posterior portion is the ramus (RAY-mus)—plural, rami (RAY-my); and these two portions meet at a corner called the angle. The mandible develops as separate right and left bones in the fetus, joined by a midsagittal cartilaginous joint called the mental symphysis (SIM-fih-sis). This joint ossifies in early childhood, uniting the two halves into a single bone. The point of the chin is the mental protuberance. On the anterolateral surface of the body, the mental foramen permits the passage of nerves and blood vessels of the chin. The inner surface of the body has a number of shallow depressions and ridges to accommodate muscles and salivary glands. The angle of the mandible has a rough lateral surface for insertion of the masseter, a muscle of mastication. Like the maxilla, the mandible has pointed alveolar processes between the teeth. The ramus is somewhat Y-shaped. Its posterior branch, called the condyloid (CON-dih-loyd) process, bears the mandibular condyle—an oval knob that articulates with the mandibular fossa of the temporal bone. The hinge of the mandible is the temporomandibular joint (TMJ). The anterior branch of the ramus, called the coro-noid process, is the point of insertion for the temporalis muscle, which pulls the mandible upward when you bite. The U-shaped arch between the two processes is called the mandibular notch. Just below the notch, on the medial surface of the ramus, is the mandibular foramen. The nerve and blood vessels that supply the lower teeth enter this foramen. Dentists inject anesthetic near here to deaden sensation from the lower teeth. Metabolism. There isn’t perhaps a more frequently used word in the weight loss (and weight gain) vocabulary than this. Indeed, it’s not uncommon to overhear people talking about their struggles or triumphs over the holiday bulge or love handles in terms of whether their metabolism is working, or not. What does orbital surface of greater wing of sphenoid bone look like? Is the lacrimal bone part of the nasal cavity? Do facial bones come in direct contact with menninges in the brain?